~~~This is a digital file~~~ I customize it~~~You print it! You can take your files to your favorite place to print, or use an online print source and upload your file and you are good to go. PLACES TO PRINT: Walgreens online, Walmart, CVS, Costco, VistaPrint, Office Depot, Uprinting.com, Gotprint.com or Catprint.com or Redtagprinting.org - There are numerous places to print online and locally. I currently accept Paypal, Etsy gift cards, and other major credit cards. I do not accept cash, checks or money orders. Payment is due before the item can be downloaded, printed, shipped or e-mailed. REGARDING DIGITAL ITEMS: Proofs will be emailed prior to sending files. I will send a proof through Etsy's "conversations" feature. Proofs are emailed within 24 to 48 hours of purchase, unless there are some unforeseen circumstances such as power outages due to weather or other natural catastrophes. Invitation Digital files that are not available for instant download, will be e-mailed within 1-3 days of purchase, unless otherwise stated due to custom design work. I will email files to the email address listed on your account unless you let me know otherwise. I will also email you a full resolution file through the "conversations" feature on Etsy. The reason for this is two-fold. 1) Some people find it easier to save JPG files from Etsy and 2) in the case a dispute should arise that you have not received your file or that the file is not full resolution, Etsy will be able to view the file. Digital files will be emailed to the email provided with your order and on your account. Please check your spam and junk box before making a claim that you didn't receive your files. Most often my emails will end up in the spam or junk folders due to an unrecognizable email address and the attachments. If after two days you have not responded to proofs or convos, I will email your files. I will still make changes, but I need to keep orders moving and waiting two to three weeks to respond to a proof makes it difficult for me to keep up with orders and process items in a timely matter. I will send a convo letting you know that I emailed your proofs and files. This confirmation will come in a "shipped" message from Etsy. I will send an RGB JPG and a CMYK PDF, please let me know prior to sending finished files if you need another format. It would also be helpful to know before hand if you need an additional bleed. Otherwise, your file will come with a full bleed on a 5x7. Regarding digital items: I, as a seller, assume you, the buyer, know how to download files, save to your computer and upload to appropriate printing lab. My files are high (300 DPI) resolution, and in stated size format, per listing, with a full bleed. These files should be treated as you would a photograph. Regarding Digital Items: All items are sold "as is", and will be exactly the same as the picture on the Web or as demonstrated graphically. If for some reason, your files are damaged, contact me by convo and I will try to resolve the issue immediately. In the case of digital files, if the file is corrupt in some way, I will replace the file. Regarding digital artwork: After you have received your proofs and I have supplied you a digital file, I will not refund for reason. I will resend and fix any errors on my part - within reason. However, you are also paying for my time as well as my digital artwork. Once you receive the artwork, there is no way for it to be "returned." I also will not make major changes to any design without further compensation. I am also not responsible if you do not read the actual listing you purchase. I state in each listing that this is a digital file, and the size of the invite. It is the buyer's responsibility to understand what the buyer is purchasing and to order the correct size and to understand the size and file type you need. If in the case you order one invite, but want another, I will need to refund you and you will need to purchase the correct invite. I need for all sales to match what is sent for seller protection. What you receive needs to be what you ordered, the only exception is for custom orders. Bella LuElla does everything possible to ensure a secure, risk-free purchase. In the unlikely event you are unhappy in any way with my service or products, please contact me through the Etsy "Conversations" feature immediately and I will work to resolve the issue or arrange for an exchange or refund as conditions are permit. Please do not leave negative feedback before contacting me. Bella LuElla reserves the right to cancel orders and refund monies if customer is not compliant with Etsy Policy or Bella LuElla Policy. 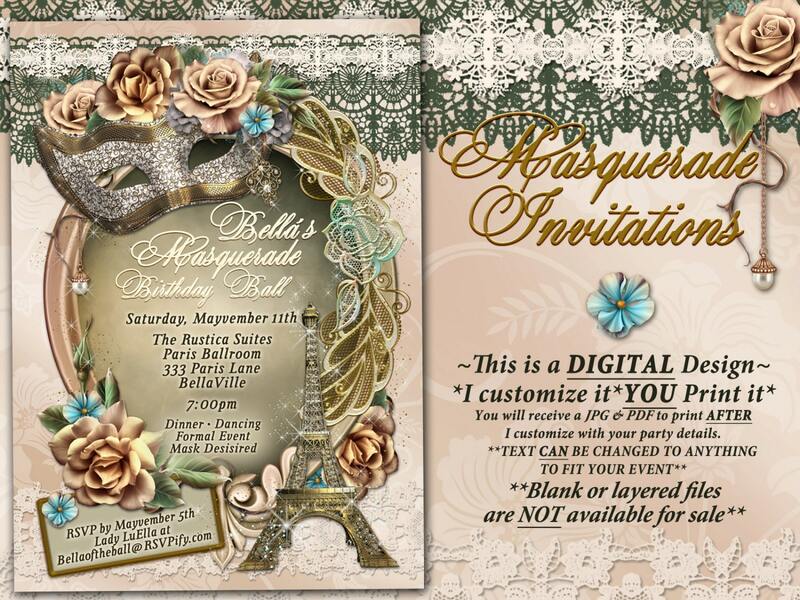 REGARDING DIGITAL ITEMS: Bella LuElla digital designs and invitations are not for commercial whatsoever. They are for personal use only. You may not use any Bella LuElla designs for commercial purposes in any way without permission. I am available to design custom pieces for you, but they are not to be resold. Please contact me with any questions you have regarding this. *** Please Note *** purchasing an invitation does not give you ownership to the art or design. You are entitled to print the invite only. You may not alter these invitations and resale them. I HAVE FILED MANY A CLAIM AGAINST SHOPS I FIND DOING THIS AND HAD THEM REMOVED. I DO NOT sell my invitations blank. I will not supply you with a blank file for you to personalize. All my files are completely flattened so the art can't be removed and reused. I WILL NOT supply a layered Photoshop file, an Illustration file or my design/artwork to you in a format that has not been flattened. ***I will make TWO revisions only to text. After I have made three changes and you request more changes, you will need to purchase an additional revisions listing. ***Color or structural changes are an ADDITIONALl fee. 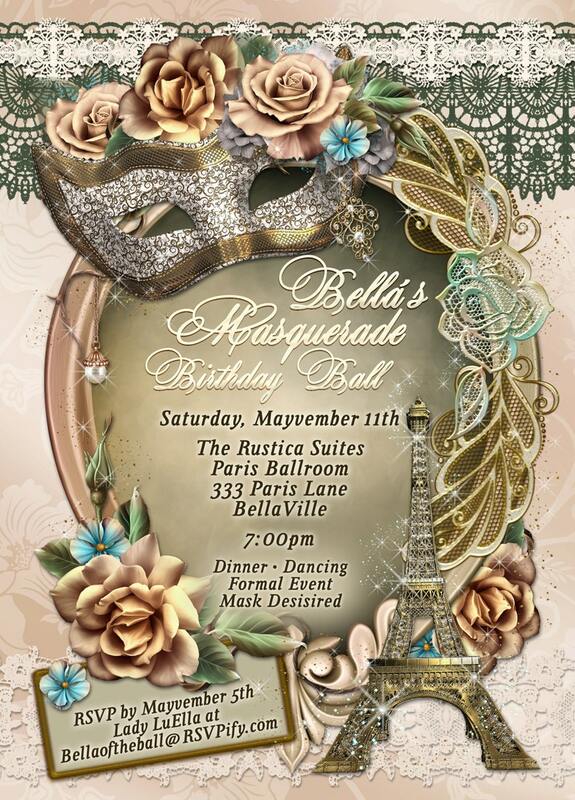 All invitations are sold as pictured, color changes require an custom listing and the fee starts at $15, on top of the cost of the initial invitation. Please message me regarding a custom listing and I will let you know if I am available to do a custom design at that time. You cannot drag over a thumbnail from your email or Etsy message to upload it online. That is not the actual file, that is a thumbnail and it will not print because it is about 9 kilobytes. You will need to DOWNLOAD the files then UPLOAD the full resolution files to print them. These files are 300 DPI, very high resolution, you should incur no issues printing if you download/upload your files properly. ***PLEASE NOTE - I do not discuss orders over the phone. I will not call you regarding your order. It is actually Etsy policy that we keep all correspondence within Etsy's system. This is the only way I am protected as a seller. We are strongly advised not to call anyone, or have contact regarding orders outside of Etsy. The reason being is that if there is a dispute about what was ordered, promised or discussed, Etsy can see all the "Conversations" so they know how to handle a dispute. I have to have written documentation regarding all orders. I can be reached through Etsy's "conversations" feature**** I am also available at my email account. By making a purchase you are in agreement with these policies and have been made aware of my terms and conditions and are in full agreement. These are digital invitations, so the price that is listed is for 1 digital file. I create the file and send it to you, and then you print as many as you need. I do not create proofs before a purchase. You are paying for my time as well as my design. After a proof is created, I will not refund because again, you are paying for my time as well as my designs. This is part of my policy. If you have any questions, I would advise you to read my policies before purchasing to have a full understanding. I send a JPG and PDF. The JPG is in RGB mode, the PDF is in CMYK mode. Both files are 300 DPI. I design typically with a full bleed and .125" extra for trimming. No text within that area, but there will be art.